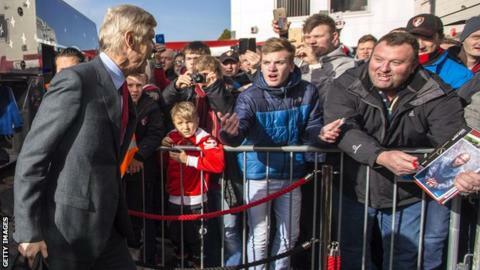 Arsene Wenger said Arsenal's 2-0 victory over Bournemouth on Sunday sets up a "must-win" game against Leicester next weekend. The Gunners had not won any of their previous four Premier League fixtures and had slipped eight points behind the league leaders before kick-off on Sunday, a gap they reduced to five points with victory on the south coast. Mesut Ozil and Alex Oxlade-Chamberlain scored as Wenger's team won in the league for the first time in more than a month. After the game, Wenger spoke about the title race and reserved special praise for Germany playmaker Ozil. Third-placed Arsenal host the Foxes at Emirates Stadium on Sunday, with second-placed Tottenham travelling to fourth-placed Manchester City on the same day. A victory against the Foxes would put Arsenal two points off the summit, but Wenger believes Claudio Ranieri's side are rightly the bookmakers' favourites. "Leicester were running away and us playing them next week makes the game very interesting," he said. "It's a big game and an important weekend for the Premier League. In one week, Leicester have beaten Liverpool and Manchester City, so that means that they suddenly become the favourite to win the Premier League." Ozil scored against Bournemouth for the second time this season - hammering home from 12 yards following Olivier Giroud's knockdown. It was the first of two Arsenal goals in 88 seconds that turned the contest and ensured the visitors took all three points. "Mesut has become a very important player," said Wenger, of his £42.4m signing from Real Madrid. "He has added a fighting attitude today. "It was a top, top, top performance from him. "He scored with his right foot which is very interesting for us. If he scores with his right foot he will become even stronger."